A recent Nearpod update enables the seamless integration of prepared Desmos links within Nearpod lessons using the URL content tool (SWEET). This equips students with an interactive graphing experience that only Desmos can provide, while enabling a silky smooth workflow for students to share their graphs. Within a Nearpod lesson, students are taken directly to the specific Desmos link. They do their thing, and take a screenshot. Next, providing students with an empty “Draw” slide in the Nearpod lesson gives them a place to submit their screenshots. Finally, screenshots can be shared anonymously to students’ screens, or the teacher can showcase them at the front of the room for comparisons and discussions. Want to experience the Desmos/Nearpod workflow? 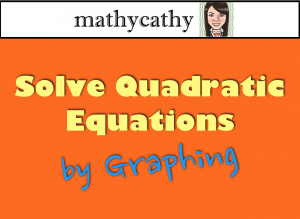 Here’s a recent lesson on solving quadratic equations by graphing with Desmos, with a TI graphing calculator, and graphing by hand using common characteristics of quadratics. On another note, Michael Fenton’s “Match My Graph” resources housed in ThingLinks have inspired folks to create and organize new, prepared Desmos “mini-challenges”. Teachers-in-training have begun creating and sharing these on Twitter. Love that. P.S. The power of Twitter never ceases – a kindred spirit! This entry was posted in Algebra 1, Pre-Algebra and tagged Desmos, nearpod, quadratic, thinglink, Twitter. Bookmark the permalink. I love this idea. I thought of something similar with Padlet, but this looks so much better. Q: how do you get the Desmos links to work? Is there a way to save them? Do you create them on their website? To “save” a Desmos link, access Desmos on the web and be sure to create an account. Create an awesome Desmos activity, and when you want to save it, rename it and click the disk icon (both can be done from the upper-left corner of the screen). Voila! The URL Desmos generated when you saved it is now preserved for students to explore. Hope that helps!